This island trip is no vacation. It's the near future, and there's conflict on a global scale. If that sounds familiar, it's because it's the plot of any number of video games (and books, and movies) already available and in production. Arma III takes the concept in a slightly different direction by focusing more on a strategic, tactical shooting experience, rather than your typical over-the-top shooter. For those unfamiliar with the Arma series, here's a quick recap: developed by Czech Republic-based Bohemia Interactive, Arma: Armed Assault was released in North America in 2007, followed by Arma II and an expansion, Operation Arrowhead, a couple of years later. 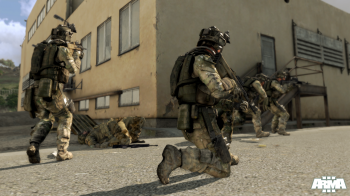 The series has been praised for offering a realistic military tactical shooter experience, but critics also found that the realism made the difficulty level hard to deal with. When I was shown an early build of Arma III yesterday, I was told that the realism had returned, but the developers were improving the technology behind the gameplay. Some of the additions are simple, like customizable weapons and equipment, but others were more complex. For starters, they focused on realistic vehicle physics, which they showed off by driving around the screen in a tank. You'll also be able to pilot helicopters and boats, as well as other land vehicles, and from what I could tell the physics do look solid; inanimate objects moved appropriately when being bumped by a vehicle, rather than flying into the distance, exploding, or any number of other ridiculous scenarios some war games try to present as normal. Arma III takes place on a Mediterranean island, and I was told it was the largest area of any game in the series. The island offers many different objectives, so it's not just about moving from point A to point B. I even got a look at some underwater diving, which can be done by equipping scuba gear to your soldier. There seems to be a lot of variety in the gameplay, but it's clear that Bohemia is striving for that same realism their games are known for. The game has a single-player campaign and a multiplayer component, but since I was presented with a few different elements new to the series and didn't really get to see a lot of action, it's hard to judge the gameplay. Graphically, it's looking really solid, with a lot of attention paid to the details of vehicles and equipment in particular. The potential for the gameplay improvements that were promised is definitely there, and it seems like Arma III is just the game to appease fans of the realistic military tactical shooter genre.